The USMLE World question bank is the highest rated question bank on the market. USMLE World (UW) is harder than the actual test and it’s the ultimate source to do well in the USMLE Step 1. There are other good question banks such as USMLErx and Kaplan Qbank but you should always make UW your primary question bank. I completed USMLErx had various errors and I was able to identify them because I did one round of UW before I started on USMLERx. On the test I saw some of the same questions tested in a simple manner. On UW a concept may be tested on 3 to 4 steps, while on the actual test the same concept may be tested on 1 to 2 steps. First Aid for the USMLE Step 1 book. I’m glad I did USMLERx because I was given an anatomy question on the Step 1 that was not UW. And it was a simple question regarding a ligament tear and I remembered it right away because I was not familiar with that concept. I can’t discuss which questions I got on my test because it’s against the USMLE rules, but if you do as many questions as possible then you covered all your ends. I can’t comment on Kaplan Qbank because I didn’t use it but the more questions you do the better. If you do all question banks UW (2 times), Kaplan QBank, and USMLERx then there should not be any reason for you not to be ready. If you do all the question banks then you have a high chance to kill the USMLE Step 1. I wish I did all the question banks, but I only did UW and half of USMLERx; that was once of my biggest regret for the test. This post should be familiar to you and if you are looking for a way to modify your First Aid for your studies. 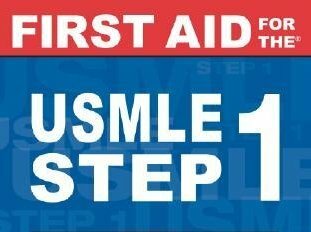 I know you heard this millions of time, but I’ll say this from my own experience, First Aid for the USMLE Step 1 is a must. I passed the Step 1 with a great score, above the national average, with just remembering the little gritty details from the book and from the notes I wrote down. Learning from the book is a waste of time. You should not be reading cover-to-cover and trying to learn from it. The First Aid for the USMLE Step 1 is not a learning tool instead, it is a outline for what will most likely be on the test. The First Aid should be used in conjunction with USMLE World question bank. Of course you should memorize the First Aid book cover to cover but only if you learned the materials beforehand. When you understand the medical concept then memorizing it is so much easier. I strongly recommend you go over First Aid book with Doctors in Training after you do one round of USMLE World question bank. Make sure you get the latest version of the book. Get the First Aid for the USMLE Step 1 2013 version if you are just starting out. It’s not out yet but you can pre-order it when it comes out in January 2013. Honestly, I was lost when I was reading the book, but Doctors in Training (DIT) program helped a lot get a good grasp of the materials covered. I will write detailed reviews of DIT and USMLE World question bank in a later post. I probably read in detail each and every page of First Aid more than ten times. I wrote a lot from USMLE World and other sources. If you look at the pictures you can see that I had I hole punched and ring-binded so it would be easier for me to flip through it. Also, if I needed extra space to write in some information, I can just add ruled paper or if I need to draw a diagram I can add printing paper. Basically, I did what I needed to do in order to fully study comfortably. Overall the First Aid for the USMLE Step 1 is a great book and you should buy the latest version. Also after your purchase, you should go to the First Aid team’s website and go over it’s errata and correct the errors on the book; it’s a hassle I know, but it’s worth your time. Do your best to understand and memorize all the concepts in the First Aid book, because it has everything you need to get a great score on the USMLE Step 1.